First Lady Melania Trump had to cancel a planned visit to a Philadelphia Children’s hospital this morning after her plane had to make a turnaround to Andrews airport when smoke and a burning smell was detected onboard. Ms. Trump's spokeswoman Stephanie Grisham said in a statement that "everything is fine and everyone is safe." 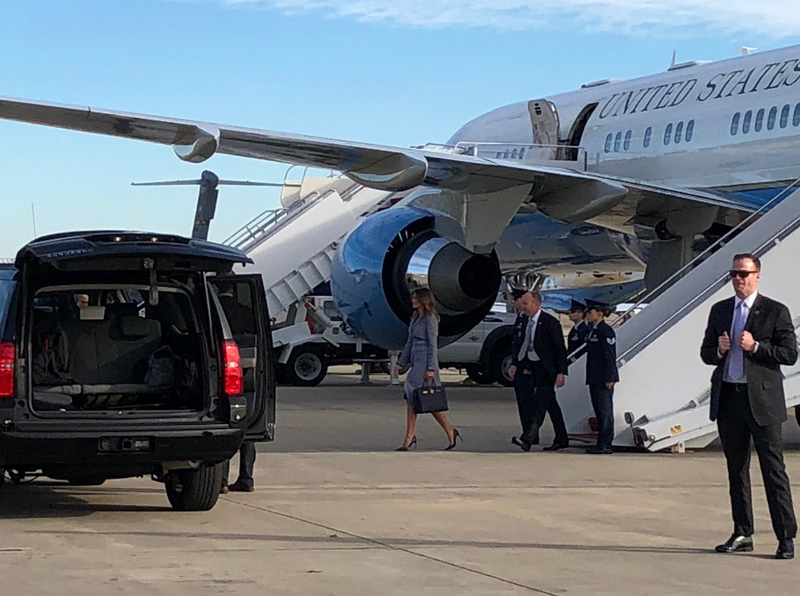 The first lady was on her way to an event to promote her ‘Be Best’ campaign together with Health and Human Services Secretary Mr. Alex Azar at Thomas Jefferson University Hospital in Philadelphia. Ms. Grisham said they are "evaluating travel plans" in regards to the event which will normally be rescheduled. CBS News correspondent Steven Portnoy tweeted that smoke was reported on board the plane, saying: "Shortly after takeoff passengers were given wet towels to cover their faces in case the smoke became too strong." According to the press on board the plane there was a "thin haze of smoke" and burning smell and passengers had to breathe through wet towels. Ms. Trump had planned to tour a neonatal intensive care nursery and speak at a US health department conference on a new system that tracks infants suffering from opiate withdrawal, all as part of a promotional tour for her "Be Best" campaign, which focuses on major issues affecting children, including the importance of healthy pregnancies. She has recently finished her first solo tour of Africa which saw her visit four countries. more opioid hysteria. it's basically a bunch of savage jigaboos that are the problem but Trumpy is using it as a Reaganesque drug-war issue. stupid is as stupid does.